Customize one of more than 75 excellent website designs. Extra support and advice to help you implement SEO on your website. ITC’s Insurance Website Builder provides more websites for insurance agencies in the United States than any other website provider. Our insurance website experts know insurance website design so you get a strong online presence. We build yours and every insurance agency website with one goal in mind: to help you compete and sell insurance online. Try our fully functional sample, and see what Insurance Website Builder can do for you. 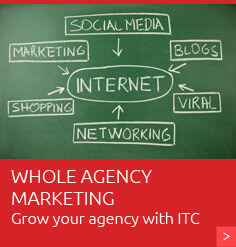 A good website will give your agency authority and legitimacy online. If you want a quality insurance website design to make a good impression, you need Insurance Website Builder. You can get a new website in as few as 10 business days. We have a website plan for any budget and agency. Plus, we have no contracts. So you can switch plans as your budget and needs change. Need more reasons to choose Insurance Website Builder? With Insurance Website Builder, you don’t have to have design experience or knowledge to get a great website. You can have a professional looking insurance agency website. Over the years and after many websites (more than 4,000 and counting), we have perfected our insurance website design process. This means you can go from an idea to a live website in 10 business days. What’s our process? Here is a short overview. Choose your insurance website template. You have a consultation with a website coordinator, during which you will discuss your design requirements and customization to your website template. We design personalized graphics specifically for your insurance agency website. Review your proof website from your coordinator. If you wish to modify the design, request your changes. These will go back through design and setup. Approve your insurance website design, and your new insurance agency website is live. Insurance Website Builder is part of our Whole Agency Marketing plan. With the whole agency marketing plan, we will review your marketing plan and provide an assessment of your existing marketing efforts. We will also make recommendations on how to improve your offline and online marketing. 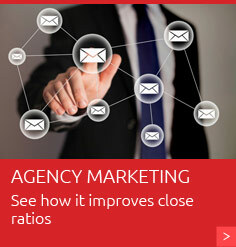 The goal of our whole agency marketing plan is to make your agency visible, get your agency noticed, and keep your agency connected.